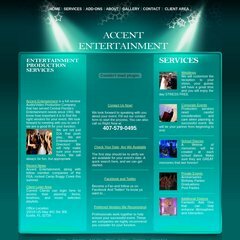 Topics: Gallery, Client Area, and Accent Entertainment. Age: It went live on June 2nd 2003, making it over 14 years, 10 months old. Fortress Colocation Centers (Washington, Seattle) is the location of the nginx server. Accentdj.com's IP address is 173.225.21.6. There are 2 Nameservers, ns5.fluxservices.com, and ns4.fluxservices.com. PING (173.225.21.6) 56(84) bytes of data.